The gutters on your home serve an important function by protecting it from water damage caused by overflowing rain. When your gutters become clogged with debris, they’re unable to move this water safely away from your home. They might also start to sag and pull away from your roof, which can increase the risk of serious water damage that could end up causing rot, mold growth or structural damage. If you have trouble keeping your gutters clean, gutter guards provide a convenient way to do so. Before investing in this kind of gutter protection, it’s important for you to know more about the different types of gutter guards, including their pros and cons. 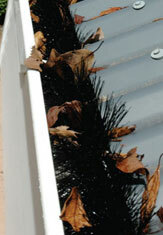 Brush gutter guards, which are made up of bristles, resemble giant pipe cleaners that fit right inside your gutters. The bristles on these guards are in an upright position, which causes leaves and other debris to stay on top of them while also allowing rain water to move through your gutters. Brush gutter guards are relatively easy to install. They don’t block all types of debris. Smaller debris, such as maple spinners and pine needles, can get caught in the bristles. These gutter guards can get clogged very easily. In order to clean out your gutters and remove smaller debris, you have to take brush gutter guards out completely. These can end up being more of a hassle than not having any guards installed. Avoid brush gutter guards at all costs. Foam gutter guards are foam pieces that fit inside your gutters. Having these guards in place stops debris from building up in your gutters. Foam gutter guards are inexpensive and easy to install on your own. It’s possible for seedlings and trees to grow inside foam guards, which can damage your gutters. They can prevent clogs inside your gutters, but clogs can easily form on top of these guards as debris builds up on them. Some of these guards are fire hazards. You have to take these guards out to clean your gutters, then reinstall them afterward, which requires more effort than not having any gutter protection. Foam gutter guards might be cheap, but they are not worth the cost or the extra time needed to maintain them. Reverse curve or surface tension gutter guards are designed to move rainwater down. They also cause leaves and other debris to drop down to the ground rather than collecting in your gutters. Most of these gutter guards are professionally installed. Some also have a type of warranty, which offers peace of mind. These guards are better options than foam or brush guards. Most of these guards lift up roof shingles, which could void your roof warranty. They can lower your home’s curb appeal, since they are noticeable from the ground. The cost of installation can add up, since some companies also make you buy new gutters. They don’t work as effectively as they should. Clogs can form when debris builds up in the opening. You might also have a pest problem if bees or wasps get through the opening and build nests in your gutters. Reverse curve or surface tension gutter guards should be avoided. They are only a short-term solution, not a long-term one. These are screens with large openings or holes that fit onto the top of your gutters. You can install them on your own or have them installed professionally. Screens are fairly easy to install yourself. They are an affordable option for guards. The large openings or holes in these make it possible for all kinds of debris to get through, except for larger pieces of debris, such as bigger leaves. They can blow off your gutters in windy conditions or during storms. They can become clogged unless you take them out and clean your gutters.Advice: These might be a suitable option if you need an affordable solution that you can install on your own. Keep in mind that you’ll have to remove them and clean your gutters at least once a year. These might be a suitable option if you need an affordable solution that you can install on your own. Keep in mind that you’ll have to remove them and clean your gutters at least once a year. Plastic gutter guards fail after a few seasons of hot or cold weather. Micro mesh gutter guards have tiny holes that are barely visible to the naked eye. These guards, which are typically made of stainless steel, allow water through while keeping debris out. Consumer Reports named these as the best type of gutter protection. They offer a permanent solution to clogged gutters, and they are usually backed by a warranty. Several types of these systems are available, but some of them are inferior in terms of quality. They cost more than DIY solutions. Micro mesh gutters guards are an ideal option if you want a maintenance-free system to protect your gutters. Look for micro mesh guards that offer different screen sizes and protection for all kinds of clogs. If you’re thinking of having micro mesh gutter guards professionally installed, All American Gutter Protection is here to help. We offer aluminum frame and stainless steel micro mesh that provides you with peace of mind from having clog-free gutters. Our micro mesh gutter guards are guaranteed for the life of your home! Thanks for your comment about how you can get gutter guards to keep them clean. I like how you said that this can move the water to your house in a safe manner. My husband and I are considering getting gutter guards for our house to keep it safe and free from a lot of debris. I loved how you talked about the surface tension gutter guards and mentioned that they’re a better option than foam and birch guards because they’re most likely professionally installed an have warranty. To be honest, I don’t really know much about the gutter guards since it’s most likely a man thing. However, since we don’t have a brother or a dad, my sister resorted to asking me for help when someone recommended putting a gutter guard in her home. I’m researching now, and I hope I can find someone who can help. Thanks. Does the micro guard require annual upkeep as well? We have Oak on two corners of our roofline. Thanks for explaining how Consumer Reports named that micro mesh gutter guards are the best type of gutter protection. My home has been through a lot of storms recently, and leaves from our backyard tree keep on getting stuck in our gutter. I might have to look into getting something like a micro mesh gutter guard system for my home.